WASHINGTON (CNN) - The US State Department has yet to use tens of millions of dollars in funding lawmakers allocated to counter Russian misinformation and propaganda, even as intelligence chiefs have warned that Russia is actively targeting the 2018 midterm elections. Critics point to Secretary of State Rex Tillerson's months-long delay in asking for readily available funds for the Global Engagement Center, tasked with leading the counter-propaganda effort. Now, officials say, they've requested $40 million that is set to arrive in April, while another $53 million is expected in the months to come. Some $80 million had been left on the table for months. "It took longer than we would have liked to get the money, but we are moving forward," said Steve Goldstein, the State Department's undersecretary for public diplomacy and public affairs. "We all know there's disinformation, and we are fighting that daily." Tillerson himself acknowledged Monday that his agency can do more. Asked at a photo spray whether the State Department can do more to counter Russian disinformation, Tillerson said, "We have more to do," and left it at that. Goldstein and other senior State Department officials push back strongly against suggestions that the agency has been slow to move against Russian election interference or is indifferent to Moscow's meddling. Referring to the Global Engagement Center, which coordinates the interagency effort to counter Russian disinformation and terrorist messaging, Goldstein said, "The GEC and the department take this matter seriously." Recent reports have renewed criticism of Tillerson, charging he's been slow to request funds for the Global Engagement Center. Even as lawmakers urged the administration to act against Russian meddling and the terrorist messaging of groups like ISIS -- and gave it funding to work with -- Tillerson left almost $80 million on the table for months. Lawmakers and career foreign service officers questioned his inaction and whether it reflected President Donald Trump's reluctance to acknowledge or respond to Moscow's meddling. But State Department officials said the delay was due to Tillerson's desire to do a careful and broad policy review, as well as the Global Engagement Center's reputation as inefficient and ineffective. "Effectively addressing state-sponsored disinformation in today's information environment is a complex challenge and State Department leadership felt it was important take the time to assess the threat and related challenges, review ongoing activities, and develop coordinated initiatives that could effectively address those threats and challenges," a State Department official said, speaking anonymously to discuss the funding. Now, officials say, major funding is on its way and in the meantime, the agency will kick-start efforts with a smaller grant to solicit ideas from private partners. The State Department will soon get $40 million from the Defense Department, based on funding authorized by the National Defense Authorization Act of December 2016, to counter disinformation. That act authorizes the defense secretary to transfer up to $60 million to the State Department to support the GEC in fiscal years 2017 and 2018, provided that the center's total funding doesn't exceed $80 million in either year. "After the Department consulted widely within the US government, with other governments, and with experts in civil society and the private sector, Secretary Tillerson approved a classified strategy to counter state-sponsored disinformation and propaganda, and the request for $40 million was made to DoD on August 25," the official said. The GEC followed up with a formal written request on September 18, the official said. The funds will be used for pilot projects designed with the Pentagon to counter propaganda and disinformation, not just from Russia but from China and other countries as well. Tillerson spoke at least twice about it with Defense Secretary James Mattis, requesting the funding in August, according to Goldstein, who said it's expected to arrive in April. The State Department announced last week it will initially award $5 million in grants from an "Information Access Fund" that will focus on helping private and public partners, including civil society groups, nongovernmental organizations and media groups, fight back against foreign disinformation. The agency also said it would use $1 million in seed money from the public diplomacy budget to get things rolling quickly. 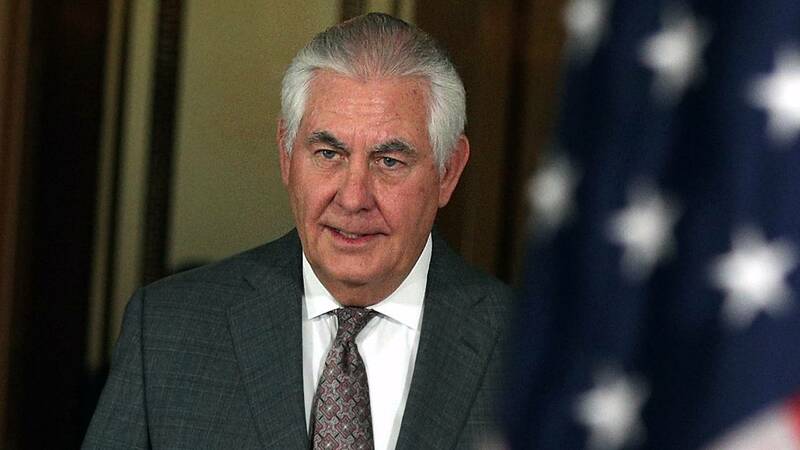 Separately, Tillerson requested a little more than $53 million for fiscal year 2019 that will go into effect later this year. Through its European bureau, the State Department also spends about $1.3 billion on information interdiction, which is meant to stop disinformation and develop new and innovative ways to redirect and stop threats on the web or in other venues. Goldstein and other officials have also met several times with the tech companies to push them to develop stronger algorithms and artificial intelligence to counter misinformation.